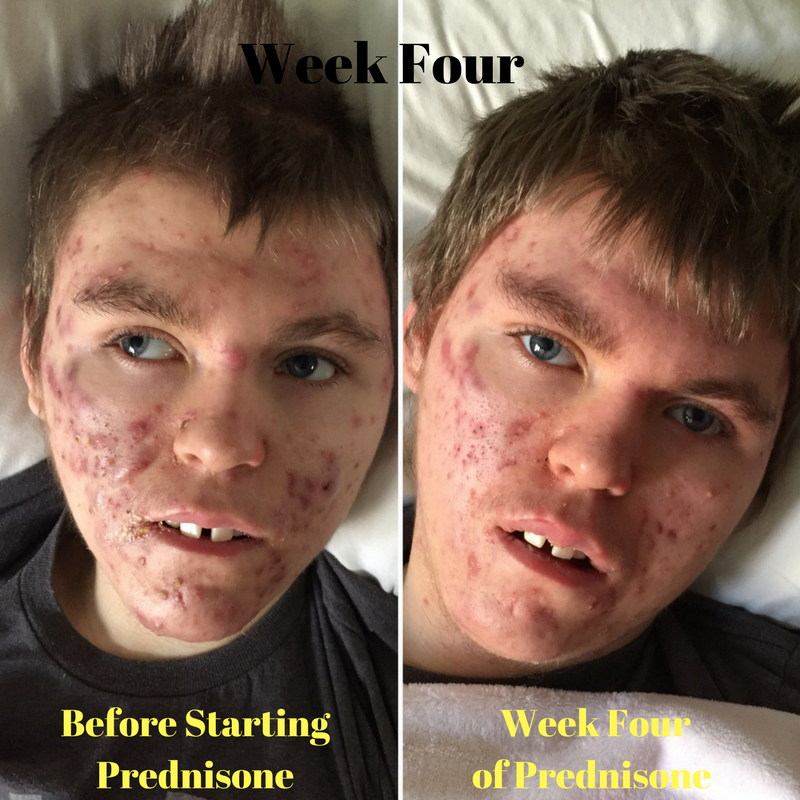 At the end of week 4 on prednisone, we had a follow-up appointment with Max's dermatologist. We discussed starting the wean off of prednisone, but it will be slow. I think the end of it will be in mid-March. He's been handling the wean fairly well so far. He has had some moments of rage and definitely having interrupted sleep, but those were also happening before we started the prednisone. It's just now when he wakes in the middle of the night there's no chance of him getting back to sleep, and when a mood swing starts it always ends with him safely in his bed to kick it out. He told me in speech therapy yesterday that he likes to be awake at night because "best things happen at night. it's fun." Oh boy. His skin continues to clear up with his face and chest looking the best. His back is still pretty irritated, but he's always laying on his back in his chair. At night he will let us lay him on his side, so he has some relief then. He's been on the naproxen for two weeks now and he is not complaining of the pain nearly as much. On very cold days we will notice he's a lot tighter and guards his arms close to his body rather than moving them around. We got a long list of creams, lotions, sunscreens, eye drops, and body wash from dermatology. The Accutane will cause his oil glands to shrink, so there is drying that will happen. He's been really good about letting me put vaseline on his lips...I will report back on how putting thick cream all over him goes. He's always been less than helpful when it comes to putting creams and lotions on. After the dermatology appointment, we had to get a baseline blood draw to see what Max's metabolic levels are before starting the new medicine. It's something they will watch since it's not a medicine that has been used before in his specific type of metabolic disease. Forever the frontrunner, this one. We are waiting to hear back from dermatology on when we will be starting the isotretinoin since the dose his dermatologist wants to start him at only comes in gel caps. When she said that we were both quick to point out that "gel" stands for gelatin -- which Max is extremely allergic to. So, they're talking with the manufacturer to see if it's animal gelatin or vegetable gelatin. It it's animal, we go to plan B...which is yet to be determined. With the prospect of having to put cream on Max's scalp, I talked him into letting me give him a haircut. He hasn't had one since around his birthday and he was starting to look a little shaggy! But he had so many acne spots on his scalp that cutting his hair was out of the question. The spots on his scalp are nearly gone so I had a go at it last night. I do love seeing those bright blue eyes of his! This makes it easier to see the spots and make sure it's all healing up well too. The back of his head has quite a few scars now. They'll get covered when his hair grows in a bit, and he's no stranger to scars. I know it could have been much worse...just google images of acne fulminans...but I still hate to see how much of his head was covered. I was running my hand over his big guy head this morning, fooling myself that he would actually go back to sleep, and remembered doing the same when he was a tiny baby. Always stroking his hair, holding his head close to me. It reminded me of this moment. He was just 3 months old here. 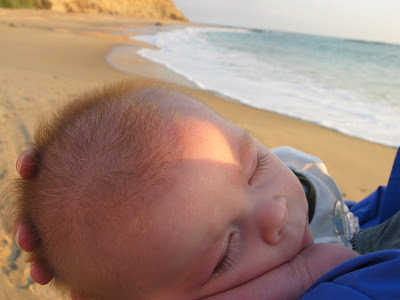 His first trip to the ocean, in California. We learned on that trip that he was having seizures. I would hold him and stroke his fluffy ducky hair. He's always going to be my perfect little baby...scars and all. I'm hoping the steroid wean continues to be uneventful and we can start the acne medicine soon.